This piece, the lead Artisans story in this week’s Variety, was both complicated and a joy to write. 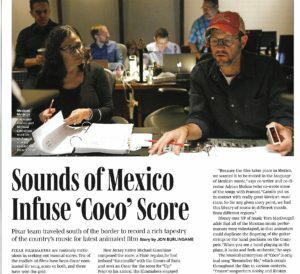 Disney/Pixar always goes to great lengths to find the right score (and often songs) for each of its films, but on Coco they went to extremes. Coco, which opens next week, is set during Mexico’s “Day of the Dead” celebration, and is about a boy who desperately wants to be a musician — something his family is dead-set against. The filmmakers hired the ever-reliable Michael Giacchino (Ratatouille, Up) to compose the score, but added Mexican-American composer Germaine Franco to orchestrate and co-write several of the songs. And they arranged for many of Mexico’s top musicians to perform much of the background music you hear. Oh, and not incidentally, they asked Frozen songwriters Bobby Lopez and Kristen Anderson-Lopez to pen a key song heard several times in the movie. 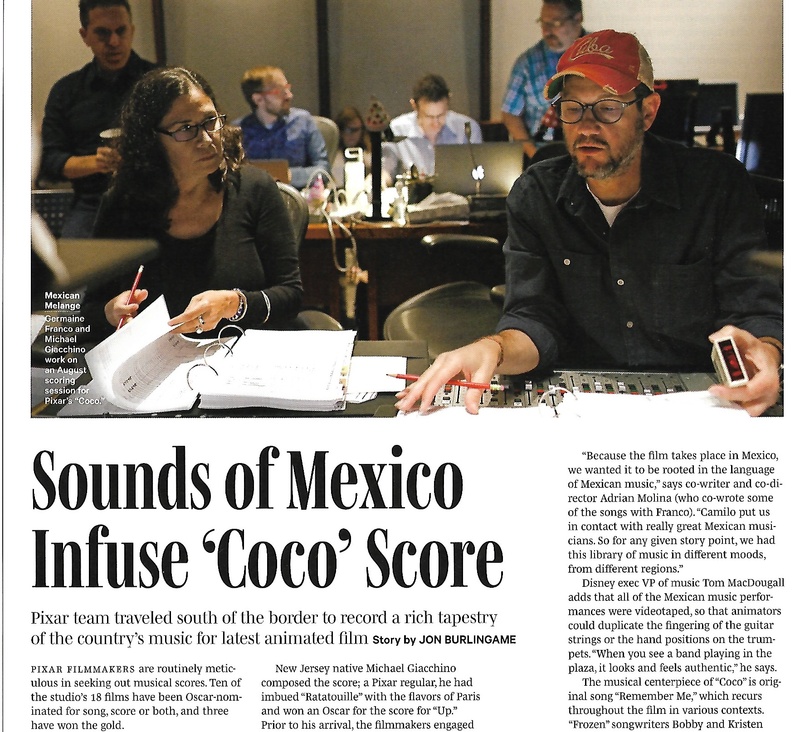 This entry was posted in Composers, Film Music, Interviews and tagged Bobby Lopez, Coco, Disney/Pixar, Germaine Franco, Kristen Anderson-Lopez, Michael Giacchino, Pixar's Coco, Variety on November 15, 2017 by Jon Burlingame. 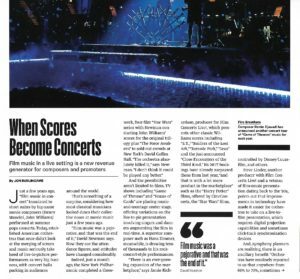 Movie music in the concert hall seems to be, as they say, “trending” — it’s more popular than ever, and in many different forms. 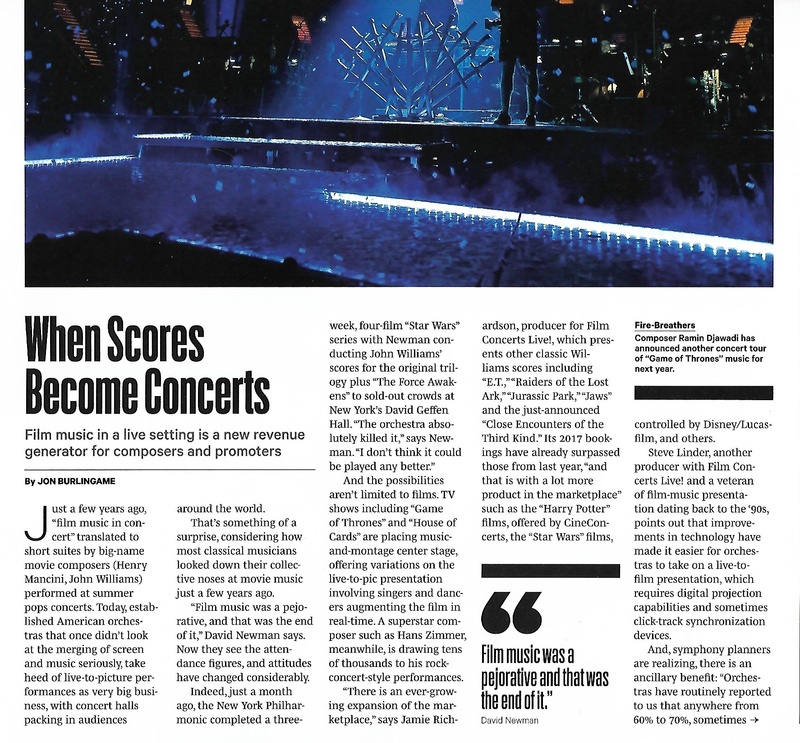 For the lead story in this week’s Variety “Music for Screens” section, I interviewed three composers (David Newman, who recently conducted the New York Philharmonic in sold-out Star Wars shows ; Ramin Djawadi, whose Game of Thrones tour was so successful he’s planning another; and Hans Zimmer, whose European and American tours transformed the traditional “film music” show into more of a rock concert); and three producers, including Steve Linder and Jamie Richardson from Film Concerts Live! and Richard Kraft, who has produced a number of concerts of Danny Elfman and Disney films. This entry was posted in Composers, Film Music, Interviews and tagged David Newman, Film Concerts Live!, film music concerts, film music in concert, Game of Thrones concert tour, Hans Zimmer, Hans Zimmer Live, Ramin Djawadi, Richard Kraft, Star Wars concerts, Variety on November 7, 2017 by Jon Burlingame.